Our Christmas concerts were rousing affairs, featuring some ‘big sings’. We offered ‘The King Shall Rejoice’ and ‘Zadok the Priest’ by Handel, ‘O Holy Night’ and Mozart’s Spaztenmesse, as well as the usual well-known Christmas carols which the audience also sang. We were joined by the wonderful voices of Claire Turner (Soprano), Morag Boyle (Contralto), Matthew Sandy (Tenor) and Edward Price (Baritone), who sang ‘The Shepherd’s Farewell’ on their own, as well as joining with the choir for much of the rest of the programme. John Bickerdike contributed his usual superb trumpet skills and the evening finished with the inspiring ‘Hallelujah Chorus’ with which the audience were invited to join. A very large number of them did, and seemed to enjoy the experience! A large and appreciative St Lawrence Church audience enjoyed a stirring and poignant programme in this Armistice Day concert on November 10th. 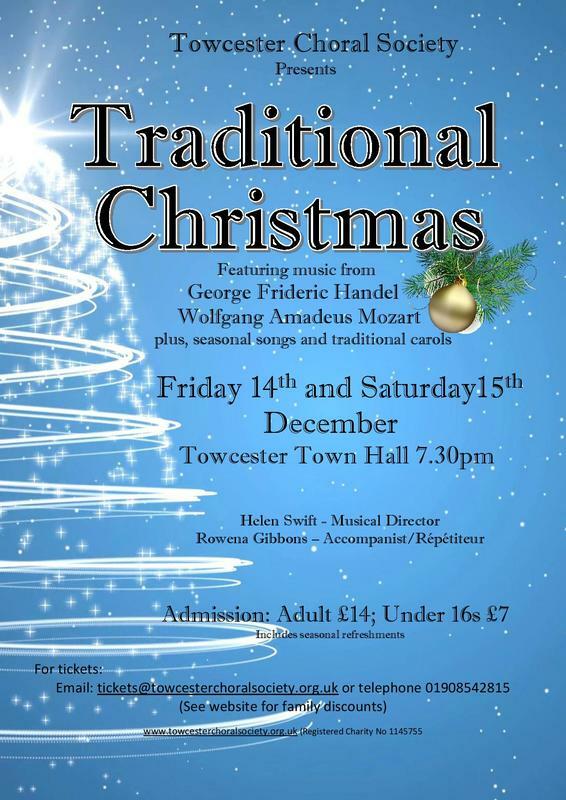 We joined forces with Towcester Studio Band, led by Neil Brownless, to perform a selection from ‘The Armed Man’ by Karl Jenkins, Zadok the Priest by Handel, ‘Hymn to the Fallen’ from the film ‘Saving Private Ryan’ (John Williams), whilst the band and the choir also contributed separate items. It was a moving experience both to sing and to listen to, the audience thrilling particularly to the sound of the Call to Prayer (featured in The Armed Man), wonderfully intoned by Hafiz Mumtaz, the Imam from the Central Jamia mosque in Wolverton. The Rev.d Ben Phillips led the choir in appropriate collects, and once again we were encouraged and inspired by our musical director Helen Swift, who also conducted the singing of Songs of the First World War by the choir and the audience. Rowena Gibbons was our accompanist. On Friday 29th and Saturday 30th June we performed ‘Zimbe!’, a lively and vibrant festival of African songs by composer Alexander L’Estrange. The two concerts were very well attended and large audiences enjoyed the wonderful sequence of traditional songs from all over Africa sung in a jazz style. We were joined by the children of Nicholas Hawksmoor School, Towcester, who did a superb job, singing all their pieces without music and accompanying them with very effective dance moves. We were also ably assisted by the Festival Jazz Group. For the Fundraising Concert held on 23rd June a large section of the choir plus supporters travelled to Banbury to take part in this event, supporting the development of the arts at Cropredy School. Parents, children and supporters enjoyed a varied programme of Songs from the British Isles. The Oxford Welsh Male Voice Choir also made a substantial contribution to a very successful evening. After the concert a good time was had by those attending the 'Ceilidh'. After a very enjoyable and successful evening, £1800 was raised for enhancing the arts activity at the school which will be put to good use,. Towcester Choral Society with Musical Director Helen Swift, again put on an amazing Easter concert, performing Mozart's Requiem with Mozart's Clarinet Concerto and Vaughan Williams Five Mystical Songs. The choir were accompanied by the South Northamptonshire Festival Orchestra and 5 soloists, a mixture of singers and instrumentalists which much surely make the event one of the biggest concerts to date. This years concert was a very special one as we dedicated it to a former member of the choir, Jean Burt who sadly passed away in 2016. Jean joined the Altos in 1955 and spent more than 50 years as a loyal member. After she left the choir she was appointed a Vice President and was a frequent friendly face at many of our concerts and money raising events. Jean very kindly left the choir a substantial amount of money which we put towards this concert to make it the best we could. May you rest in peace Jean, we hope we did you proud. ​A number of her family were able to be with us. This year the event was bigger again and better than our previous years and with all the support and help of choir members and their families for making soups and puddings and helping the event get off the ground, the event raised over £430!!! So a big thank you and well done.